In recent years, label-free array systems have taken a center stage as the research tool in many drug discovery processes. Label-free technologies are also used by manufacturers in context to patient samples to produce bio-relevant data that can result in effective drug development and precision medicine. Attana AB, Agilent Technologies, Biacore, F. Hoffmann-La Roche AG, ForteBio, PerkinElmer, Inc., GWC Technologies, Riot Block chain Inc., Molecular Devices LLC, and Bio-Rad Laboratories, are some of the leading companies in the global label-free array systems market. Increasing number of pharmaceutical companies are opting label-free array systems to reduce the cost and time of drug discovery and validation. Modern medicine is moving towards precision or personalized medicine, to decrease the risk of ineffective dosing at an individual level. However, the biggest challenges in drug discovery and development individual variability in drug effectiveness and lack of translatability of pre-clinical results. Hence, companies are focusing on developing appropriate cellular models and readout systems, to understand mechanisms and functional characterization on the molecular and cellular level. Moreover, next-gen label-free technologies including a mass spectrometer, biochip/microarray, and others have shown positive results in identifying clinical microorganisms. Companies are also developing micro plate-based optical biosensors that can be incorporated in the standard format microplates to detect small molecules, cells, and proteins. The global market for label-free array systems is anticipated to witness steady growth, increasing to 5.6% CAGR during the forecast period 2017-2024. As per the report, the global label-free array systems market is estimated to reach US$ 1,722.9 Million in terms of value by 2024 end. Bio-layer interferometry, Surface plasmon resonance, and others. 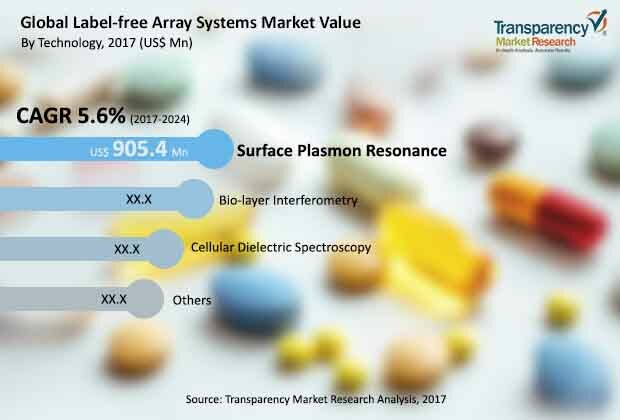 Among these, surface plasmon resonance technology is likely to see a significant growth in the global market for label-free array technology. On the basis of application, the market is further segmented into protein complex & cascade analysis, drug discovery, protein interface analysis, antibody characterization & development, and others. Label-free array systems are expected to find large application in drug discovery, followed by antibody characterization and development. By end-user in the global label-free array systems market is divided into Agriculture Research Institutes, Contract Research Organizations, R&D Laboratories, and others. Among all the end-users, R&D Laboratories are likely to account for the largest share as the end-user of label-free array systems during the forecast period 2017-2024. The systems will largely be used for drug discovery process in the R&D laboratories. Region-wise, North America is expected to emerge as the leading region in the global market for label-free array systems. The rise in chronic and life-threatening diseases is resulting in the increase in drug discovery program in the U.S. This is leading to the increasing demand for label-free array systems in the region. The companies are also introducing label-free cell-based systems for early drug discovery. Meanwhile, issues including a limit of detection and probability of device, and sensitivity of device are being optimized by manufacturers to offer better label-free array system.